Citation: Fikre R, Fiche YA (2018) Provider’s Knowledge and Availability of Emergency Obstetrics and Newborn Care Service in Case of Gedeo Zone, Southern Ethiopia 2017. Health Sci J Vol.12.No.4:585. Copyright: © 2018 Fikre R, et al. This is an open-access article distributed under the terms of the creative commons attribution license, which permits unrestricted use, distribution and reproduction in any medium, provided the original author and source are credited. Approximately 303,000 women die during pregnancy and childbirth each year, and millions more experience severe adverse consequences . The vast majority of maternal deaths are due to direct obstetric complications; hemorrhage, sepsis, complications of abortion, hypertensive disorders of pregnancy, prolonged/ obstructed labor, ruptured uterus and ectopic pregnancy [2-4]. Maternal mortality is a major health development challenge in Africa. Reducing maternal mortality has remained a daunting task despite the deployment of proven effective strategies such as the provision of access to Emergency Obstetric Care (EmONC) to pregnant women with direct obstetric complications in poor resource settings. It alone can avert 40% of intra-partum related neonatal deaths and a significant proportion of maternal mortality [5,6]. Ethiopia’s maternal mortality ratio (MMR) was 412 per 100000 live births in 2016, a 39% reduction compared with an MMR of 676 in 2011 . A EmONC facility is the one which set of seven key obstetric services, or “signal functions,” has been identified as critical to basic emergency obstetric and newborn care (EmONC): administration of Parenteral antibiotics; administration of parenteral anticonvulsants; administration of parenteral uterotonic, removal of retained products (manual vacuum aspiration); assisted vaginal delivery; manual removal of the placenta; and resuscitation of the newborn. CEmOC facility is the one which include blood transfusion and cesarean section in addition with the basic seven signal function . The UN also recommends that there should be at least 5 EmONC facilities per 500,000 populations, of which at least one should provide all the signal functions of CEmOC [9,10]. However, just having adequate number of facilities does not necessarily ensure the availability of service. Actual functionality of any designated EmONC facility with the signal functions is important. In this study area, little study shows providers knowledge and the status of the service. Therefore, this study was undertaken to determine provider’s knowledge and provision of emergency obstetric and new born care service in public health facility of Gedeo zone south Ethiopia. A cross-sectional study was conducted from September 1 to October 30/2017. Gedeo zone is located in south nation nationalities and people region (SNNPR) of Ethiopia. The city of the Zone is Dilla which is located 84 km from Hawassa city which is administrative city of SNNPR which lies 394 km South of Addis Ababa which is the capital city of Ethiopia. The altitude of Gedeo zone is 1765 m above sea level and 2007 census had a population of 847,434. A total of 39 public health facilities were found in the Gedeo Zone, on which 3 were hospital and 36 were health centers. Study population: The study populations were obstetric care providers found in Gedeo zone. Inclusive criteria: Randomly selected obstetric care providers found in public health facility of Gedeo zone and who had service greater than 6 month were participated in the study. Exclusive criteria: Obstetric care providers who have mental illness and seriously ill and cannot communicate during data collection period excluded from the study. Obstetric care providers: Those health care providers who assigned and work in MCH. Knowledgeable: Obstetric care providers answer the knowledge question above or equal to mean. Since, the source population was less than 10,000, correction factor was used to estimate the final sample size required. Using simple random sampling method 2 hospitals and 26 health centers were selected. All obstetric care providers in the study area were considered as study participants and each participant was selected by using random sampling method. A pre-tested and structured self-administered questionnaire was used for data collection. The survey questionnaire was collected using a standard check list that was adopted from WHO, UNICEF AND UNFPA emergency obstetric monitoring handbook. Pretest was done among (5% of total sample size) obstetric care providers from non-selected units by data collectors and principal investigators. Gaps identified during pretest readjusted accordingly. Then data were collected through interview and observation. To avoid biases during observation, all necessary precautions were taken. Observation tool were used to observe the overall readiness of the facility to serve basic emergency services. Score of mean value or above mean was considered as a good level of knowledge. Two day training was given to data collectors and supervisors on the objective and importance of the study before data collection. Trained data-collectors four BSc and 2 MSc supervisors were used. The collected data were entered and coded in to Epi-info 3.5.4 version statistically package and imported in to SPSS version 20 software. Frequency distribution and percentages were computed and presented by tables and figures to describe socio-demographic and other characteristics of respondents. Both bivariate and multivariate logistic regression analysis was done to determine the association of the variables. Variables significant analysis (p<0.25) entered in to multivariate logistic regression. Odds ratio with 95% CI and statically significant were declared p<0.05. The expected number of deliveries per year rate, ANC and postnatal care coverage was estimated by multiplying the crude birth rate (CBR) by total population of the zone. Population coverage of signal functions was estimated following UN guideline by calculating the number of facilities for 500,000 populations, providing related services in the last three months prior to the date of assessment using the population census data of 2007 as the denominators. Ethical approval and clearance was obtained from Dilla University, College of health sciences and medicine, institution review board (IRB). Letter of permission was obtained before the beginning of data collection from Gedeo zone health bureau. Permission letter were provided to facilities for proceeding data collection. After that participants oriented about the purpose and procedure of data collection, and that confidentiality and privacy ensured. It is also cleared that participation fully based on the willingness of participants using written consent. A total 271 obstetric care providers were involved in the study with a response rate of 100%. The mean age of the respondents was 24 (± 3.3SD) and majority 188 (69%) of them were Gedeo ethnicity. out of the total respondent 160 (59%) of them were male, 148 (54.6%) of them were single, 198 (73%) (Table 1). Table 1: Socio-demographic characteristics of the obstetric care providers in public health facilities of Gedeo Zone, south region 2017. One hospital functioned as CEmOC facility and performed all compressive signal function in the past three months. The number of CEmOC facilities per 500,000 populations was 0.59 (1/847,434) and the number of EmONC facilities per 500,000 populations was 6.8 (14/847,434). The institutional delivery rate in the study districts combined was 6.4%. Caesarean section rate was 2.3%. 13% of the health care facility performed manual removal of placenta and vacuum extraction in the past three month. 25% of health care facility missed one signal function and 70% of missed more than two or more signal functions. All of the health care facilities perform new born resuscitation. Reasons for not having performed all signal functions were sought and multiple responses were given. Lack of supplies/equipment was the most frequently mentioned reasons for nonperformance of signal functions as well in some heath care facility absence of trained staff were the reason (Figure 1). 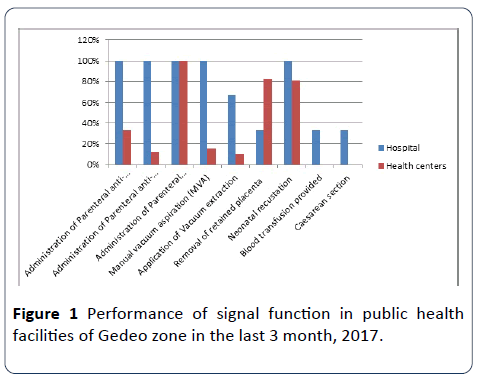 Figure 1: Performance of signal function in public health facilities of Gedeo zone in the last 3 month, 2017. Only 15% and 20% of health facility were having reliable access to telephone and clean water. Regarding availability of electricity 55% were access to electricity. All the health care facility had a formal fee waiver system and was provided maternal and newborn care free of charge. 30% of healthcare facility provided pharmacy and laboratory service 24 hours. All have functional toilet and 80% of the health care facility have functional refrigerator. Practice of signal functions in the previous three months was assessed in this study. 87% of the obstetric care providers were practiced FANC and about 64% were performed episiotomy, 34% were provide manual removal of placenta. Skills which were practiced by the least proportion of staff were management of pre-eclampsia/eclampsia and assisted vaginal delivery. 83% of obstetric provides were mentioned all essential action related with immediate new born care. 59% of the staff mentioned all essential components of active third stage management. Monitoring labor by using partograph and managing newborn with fail to breath, all essential steps were mentioned by 23% and 44% respectively. 17% of the staff mentioned all the essential action for managing newborn sepsis and 21% of the staff was practiced the management of postpartum hemorrhage. Records of 320 women were reviewed. Among those women only 17% were Primigravidae and the rest were multigravida. Regarding length of stay after deliver 87% leave the facility within 6 hours and only 6% stay for 24 hours. Only six eclampsia cases were found and two of them were referred after administered loading dose of magnesium sulfate and the remaining four were refereed without any intervention. In more than half of the case most labor was monitored without partograph and only 23% were used to monitor and only 12% of it fill all necessary information in the partograph. During their visit only 37% of women received all important components including abdominal examination, fetal heart beat, blood pressure measure and all essential laboratory investigations. None of the women were attending postnatal clinic more than once. Only 14% of the women were received Vit A and 94% of them were counseled about family planning. 9% of women were checked their blood pressure in postnatal clinic, 11% were examined their abdomen and only 6% were cheeked about vaginal bleeding. The knowledge of the obstetrics care providers towards basic emergency obstetric and newborn care had 47% (n=127). Majority providers (97.8%) had knowledge about sign of labor and (91.7%) of care providers stated components of active third stage management. Drugs of choice by obstetric care providers for PPH management were oxytocin 87%; Ergometrine 11.9% and Misoprostol 1.1 respectively (Table 2 and Figure 2). Table 2: Obstetric care provider’s knowledge towards basic emergency obstetric and newborn care in public health facilities of Gedeo zone, south region 2017. 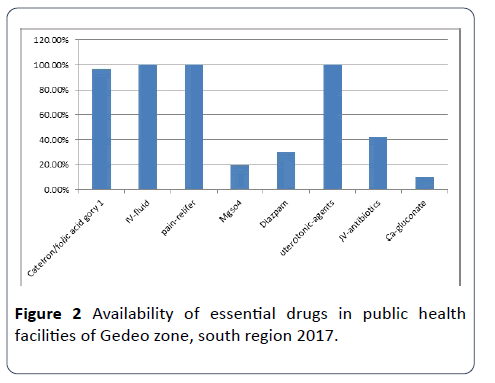 Figure 2: Availability of essential drugs in public health facilities of Gedeo zone, south region 2017. In Bivariate analysis factors found to be significantly associated with knowledge on basic emergency obstetric and newborn care were: midwives profession, qualification level, training and work experience. However, in multiple logistic regression analysis: midwives profession, training and work experience were significantly associated with knowledge on basic emergency obstetric and newborn care. Those who were midwives by profession were about 2 times more likely to be knowledgeable than others (AOR=2.47, 95% CI: 1.03-8.3). Those who were got basic emergency obstetric and newborn care training were 4 times knowledgeable with (AOR=4.32, 95% CI: 1.69, 11.86). In addition work experience more than five years (AOR=5.52, 95% CI: 1.05, 9.06) were also positively associated with knowledge on basic emergency obstetric and newborn care (Table 3). Table 3: Multiple logistic regression analysis of provider’s knowledge in case of Gedeo zone. The result of this study showed that 47% of obstetric care providers were knowledgeable towards emergency obstetric and newborn care. This might be due to providers work experience variation and due to access of the training. The institutional delivery rate is 6.4% which is very low. This is the percentage of deliveries conducted in EmONC facilities is lower than the recommended minimum of 15%. This might be poor utilization of health facilities for maternity services in the study area . Utilization of ANC services is low in this zone when compared with the national averages: 80.3% versus 97% for at least one ANC visit and 49.5% versus 81% for at least 4 ANC visits . This difference is might be due to poor community sentisazation program of providers. Only 15% and 20% respectively of the health care facility were having reliable access to telephone and clean water access. This finding is not consistent with Study in Addis Ababa stated that 100% of the health care facility were having reliable access to telephone and clear water while these were 24% and 44% respectively in 2008 . This difference is might be due to vary in geographical area. This study also revealed that 40% of the health facilities were access to the electricity. This is not consistent with Study in Somali revealed that Only 1 out of 6 MCHs had electricity . The current study stated that Ambulance services were available in all health care facility. This is inconsistent with study carried in Addis Ababa. Ambulance services were available in 50% of the HCs in 2013 while the remaining were relaying on ambulances from the fire department (command post) especially off working hours . Similar study in Somalia revealed all the health facilities did not have any means of transport facility for referral cases. Patients’ families were responsible to make such arrangements on their own . Studies in Uganda state a car ambulance were available at 46% of the facilities . This difference is might be due to different in time of the study. Our study revealed 40% of the health facility has their own sphygmomanometer in their MCH unit where as 55% of the unit have thermometer. This is nearly consistent with study in Tanzania state the availability of clinical equipment was generally lower: 61% of facilities had a blood pressure machine, 70% had an infant weighing scale and 57% had a speculum . Similarly Study in Malawi stated that all the facilities did not have postnatal care monitoring equipment like sphygmomanometer and thermometers in their maternity departments. In addition, guidelines and teaching aids for postnatal care were not available in all the facilities . This is might be due to poor resources in study area. Regarding manual removal of the placenta 42% of the facility perform this signal function this is inconsistent with study in Uganda Manual removal of the placenta had also been done by 62% of the staff . This is might be due to providers work experience variation and due to access of the training. There is shortage of medical equipment’s and essential drugs. In addition there is low coverage of infrastructure like water, light and telephone. Therefore the actual trend of EmONC is diminishing, that is the majority of the health facility have not performed EmONC as needed. We are very grateful to Dilla University for approval of ethical clearance. We would like also to extend our gratitude to zonal administration and respective Woreda/district/health office for providing us the necessary information and cooperative support for the accomplishment of this research work. Then, we would like to thank all obstetrics care providers who participated in this study for their commitment in responding to our interviews and for observations. Our gratitude also goes to data collectors and supervisors for their hard work patience in obtaining necessary information. Paxton A, Maine D, Freedman L, Fry D, Lobis S (2005) The evidence for emergency obstetric care. Int J Gynaecol Obstet 88: 181-193. Campbell OMR, Graham WJ (2006) Strategies for reducing maternal mortality: Getting on with what works. Lancet 368: 1284-1299.
WHO (2012) Trends in maternal mortality: 1990 to 2015, 2015; WHO/UNICEF, Countdown to 2015 Report. UN IGME (2015) Levels and trends in child mortality report 2015; WHO, Trends in maternal mortality: 1990 to 2015. George Schmid (2005) The Lancet's neonatal survival series. The Lancet 365: 9474. UN Interagency Group on Child Mortality Estimates (IGME) (2015) Levels and trends in child mortality report 2015; WHO, Trends in maternal mortality: 1990 to 2015. Federal demographic republic of Ethiopia maternal and child health package 2012. Yamane T (1967) Statistics, an introductory analysis. (2nd edn. ), Harper, Row. New York. WHO (2001) Safe Motherhood needs assessment guidelines. Geneva: WHO. WHO, UNFPA, UNICEF, AMDD (2009) Monitoring emergency obstetric care: a handbook. Geneva: WHO. Lawn JE, Kerber K, Enweronu-Laryea C, Cousens S (2010) 3.6 million neonatal deaths- what is progressing and what is not? Seminars in Perinatology 34: 371-386. Mekbib T, Kassaye E, Getachew A, Tadessec T, Debebe (2003) A averting maternal death and disability, The FIGO save the mothers initiative: the Ethiopia–Sweden collaboration. Int J Gynecol Obstet 81: 93-102. World Health Organization (2014) International Confederation of Midwives, International federation of Gynecology and Obstetrics. Making pregnancy safer: the critical role of the skilled attendant. A joint statement by WHO, ICM and FIGO. Geneva: WHO. Campbell OM, GrahamWJ (2006) Lancet Maternal Survival Series steering group. Strategies for reducing maternal mortality: getting on with what works. Lancet 368: 1284-1299. World Health Organization (2009) UNFPA, UNICEF, AMDD. Monitoring emergency obstetric care: a handbook. Geneva: WHO. WHO (2005) Make every mother and child count. Geneva: World Health Organization.